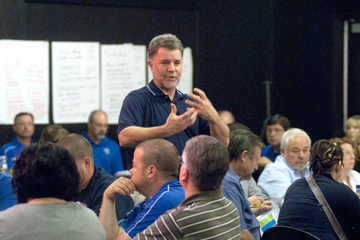 Dr. James Honan leads a discussion during the professional development program. Southeastern Oklahoma State University is continuing its efforts to meet the ever-changing challenges in higher education. One method in which to achieve this is by providing employees with innovative professional development opportunities. On June 21, a broad-based group of some 70 Southeastern administrators, faculty, staff, and students participated in a Harvard University Professional Development program at the new Donald W. Reynolds Community Center & Library in Durant. Dr. James Honan, senior lecturer on education at the Harvard Graduate School of Education, served as facilitator. The session included a case study on Southeastern Organization Structure Redesign and Transformation, and small and large group discussions. Dr. Honan's teaching and research interests include financial management of nonprofit organizations, organizational performance measurement and management and higher education administration. At Harvard, he is educational co-chair of the Institute for Educational Management (IEM) and is a faculty member in a number of executive education programs for educational leaders and nonprofit administrators. Follow-up sessions will be held on campus in August or September as well as in November with a number of facilitators from Harvard. In addition, over the past two years, a number of Southeastern faculty and staff members have attended sessions at Harvard on various topics.